The Harris’ Antelope Squirrel usually excavates its underground burrow among rocks. It is an omnivore but especially favors cactus fruits. Two ground squirrels occur in Sabino Canyon, The Round-tailed Ground Squirrel and the Harris’ Antelope Squirrel. The Harris’ Antelope Squirrel is easily distinguished by the conspicuous white stripe that runs along each side from shoulder to flank. In addition, it runs with its tail curled over its back. They are about 9 inches long, with a 3 inch tail. Ground squirrels belong to the rodent order and are a favorite prey for many predators. 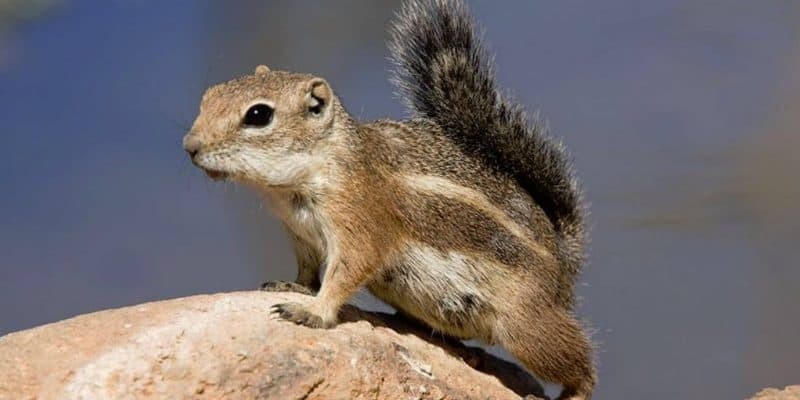 The little Harris’ Antelope Squirrel is often mistaken for a chipmunk. The only chipmunk found in Sabino Canyon is the Cliff Chipmunk sometimes seen at the higher elevations. Chipmunks have bold face patters that are lacking in ground squirrels. The Harris’ Antelope Squirrel usually excavates its underground burrow among rocks. It is an omnivore but especially favors cactus fruits. It climbs easily through cacti to dine on their fruit and seeds. Its diet also includes other seeds, Mesquite beans, insects and occasionally mice. This squirrel often makes its presence known by a long shrill trill that resembles a bird’s in clarity. They run around on the desert sniffing out seeds in the ground and digging them up. Evidence of Harris’ Antelope Squirrels in an area usually includes several two inch diameter holes under a bush or cactus and food remains nearby such as bits of cactus fruits. Unlike the Round-tailed Ground Squirrel, the Harris’ Antelope Squirrel is active all year. It is diurnal and will sometimes return to its burrow during inclement weather. During summer and fall it forages early in the morning, escaping heat and drought by retreating to its burrow for most of the day. It also rests briefly in the shade or in a shallow scrape in the soil. It lies down flat, spreading all legs out and dumps heat from its body. They also use their tails as a parasol to provide shade. Studies have shown they can tolerate temperatures up to 107 degrees F.